OTTAWA -- A shortage of sailors is making it hard for the Royal Canadian Navy to operate its ships and work on replacing them at the same time, according to a senior naval officer. 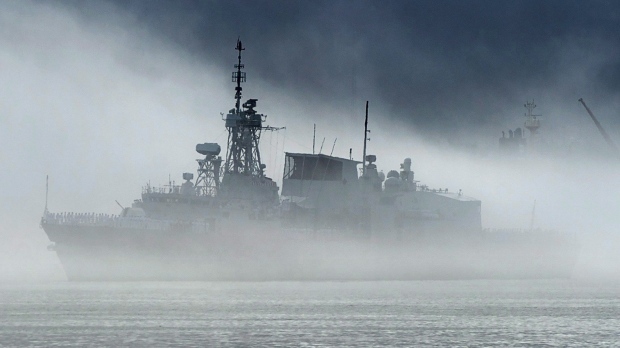 In fact, Waddell indicated during a presentation to a defence conference this week that the navy's personnel shortages could threaten the Trudeau government's "ambitious" defence policy. That policy -- entitled Strong, Secure, Engaged -- says the military must be able to conduct several missions at the same time. It also sets aside billions of dollars for upgrades to the navy, including new warships and modernized submarines. "In terms of delivering on Strong, Secure, Engaged, what I think is going to really fundamentally be a constraint in the next little while is the reality of the workforce," Waddell said. "So when you're trying to deploy and have a forward presence ... while at the same time trying to account for the institutional needs of delivering on Strong, Secure, and Engaged, you can imagine the bit of a dance that's in front of us." The navy's problem is different from the air force's: the navy is struggling to simply recruit people while the air force is losing experienced pilots to civilian jobs. Not that the navy is completely without a plan. Waddell and others have talked about using technology, particularly in its new ships, to ease the navy's personnel requirements as well as attract a new generation of recruits. "What does it mean to be a digital navy is what we're focused on," he said. "I think that's going to be key to our ability to attract (people) and then recruit them and then hopefully retain them."